A couple of years back, on one of my visits to Kolkata, I happened to walk past Elgin Road on a sunday evening and stopped to hear some extremely melodious music. I learnt from a friend that a social enterprise called Banglanatak dot com creates a cultural space for performing arts every weekend. Additionally, they have done admirable work in promoting folk and traditional arts, building skills and a host of livelihood programmes targeted towards socio-economic empowerment and inclusion of indigenous communities. One such effort is to host village festivals across Bengal. A beautifully written piece by Amitabha Gupta transported me there, and inspired me to learn about a visual wonder, called ‘Pot-Maya‘, which is a Patachitra festival, hosted from November 13-15 of this year. 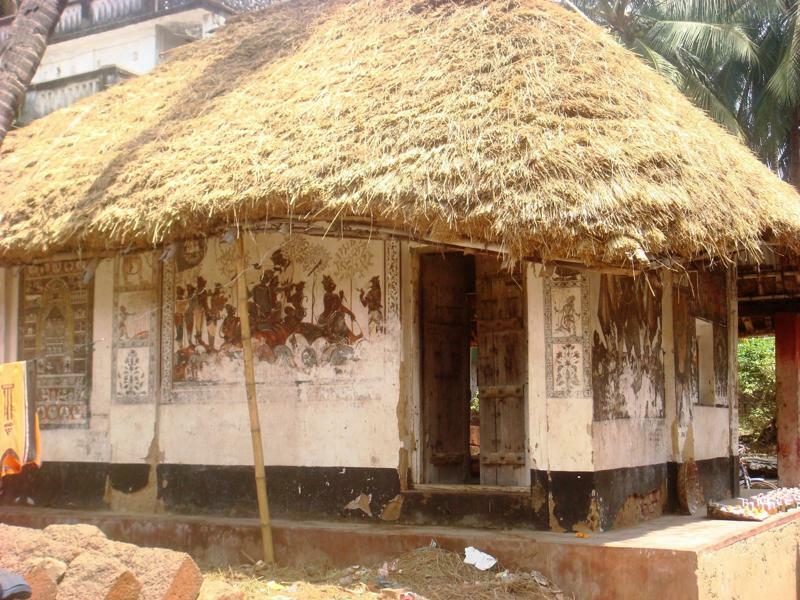 In the run up to the festival, a surge of activity, excitement and buzz is seen in the usually quiet village of Naya in the Pingla block of West Midnapore district in the beautiful state of Bengal. 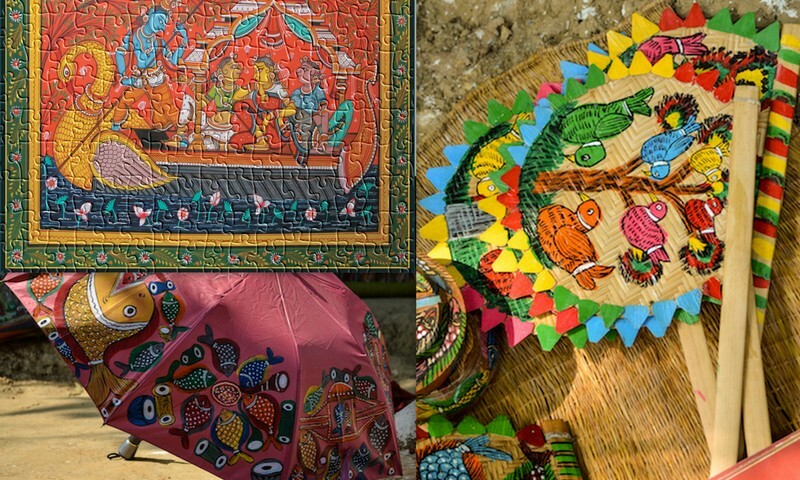 The village is approximately 4 hours drive from Kolkata and has a folk art resource centre ( CHITRATARU ) which showcases Patachitra paintings and products. Workshops are also held for with visitors learning the process of making natural paint. Tourists and visitors can attend the workshops for a nominal fee and enjoy several musical performances. 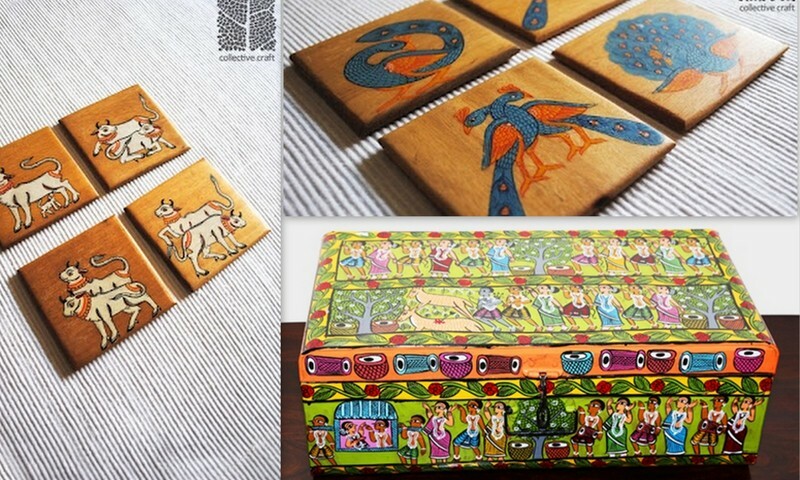 The word ‘Pata’ is derived from the Sanskrit word ‘Patta’ that means cloth. The painters are called Patuas. 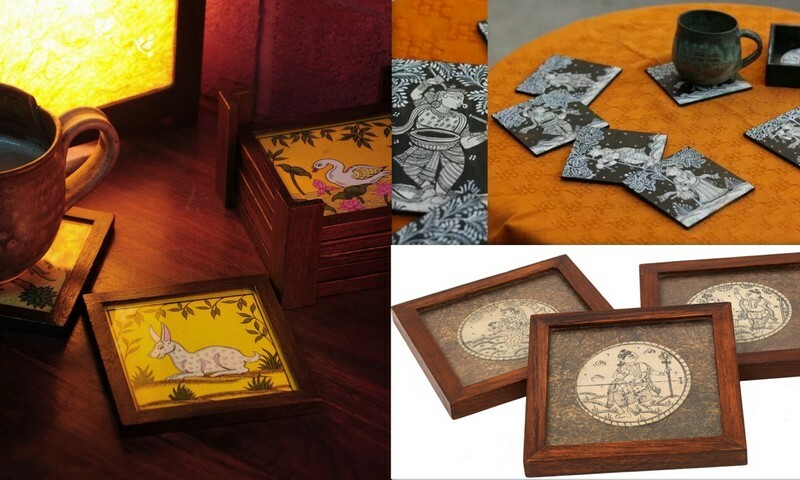 Patuas paint tales from Mangalkavyas (narratives of Hindu Bengali religious Text), Hindu Epic Ramayana and Mahabharata and some with social messages. They do not just paint, they also sing the Pater Gaan as they unfurl the painting scroll to show it to the audience. 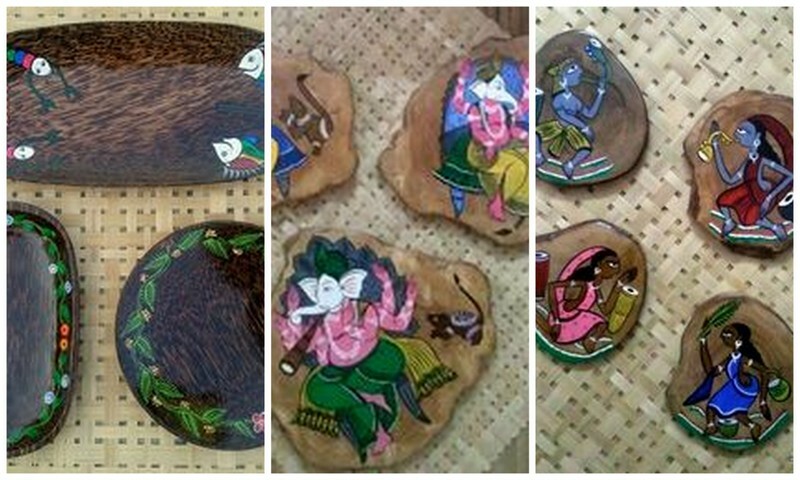 Patuas generally use natural colours, which they procure from various trees, leaves, flowers and clays. 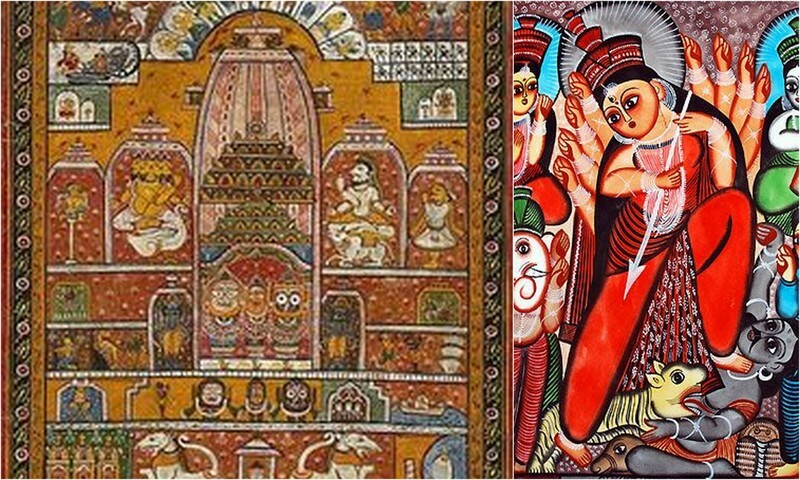 The paintings or scrolls are of mainly three different types : the Jarano or Rolled variety, the Chaukosh (Square or rectangular) and the Kalighat (style of Patuas residing near Kalighat temple of Kolkata). If the names are exotic, how can the process of painting be any less! Elaborate as it may sound, I can attempt to sum it up in a few lines, apologies for taking the romance out of the process. Here goes: sewing multiple sheets of commercial poster paper, sketching the outline of the images using kerosene lamps black soot, vermillion paste or simply a pencil, painting with mineral or plant-based colours using the sap of wood apple tree (bel) as a binder, drying and then finishing! So there it is, a fabulous Patachitra, all done! 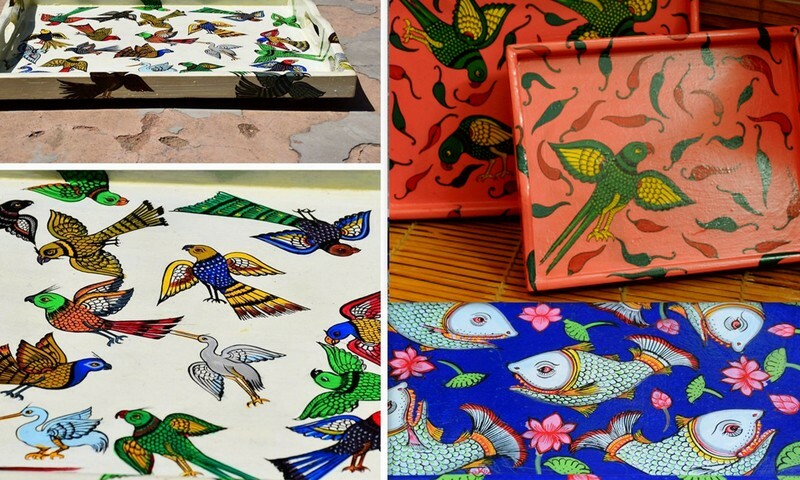 While Midnapore in West bengal is famous for its Patachitra, the GI Tag associated with this art form is owned by Orissa, where a little village called Raghurajpur is inhabited by artisans who produce sheer poetry on pieces of treated cloth, dried palm leaf or paper. 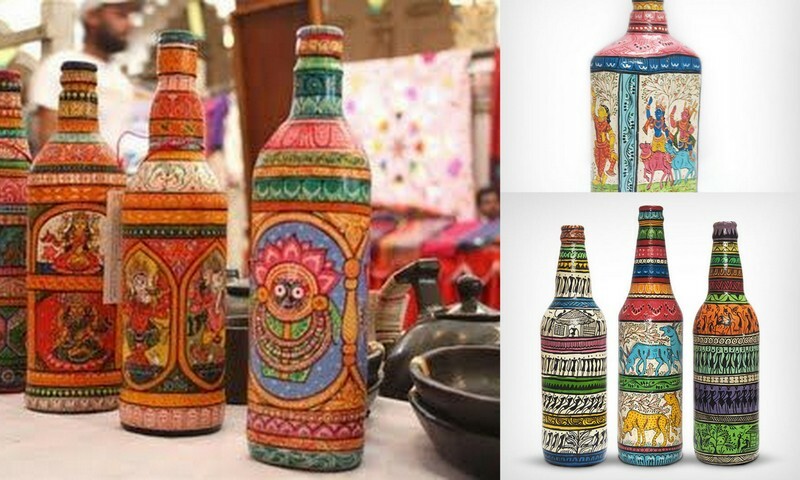 The Pattachitra from Raghurajpur has its signature style. 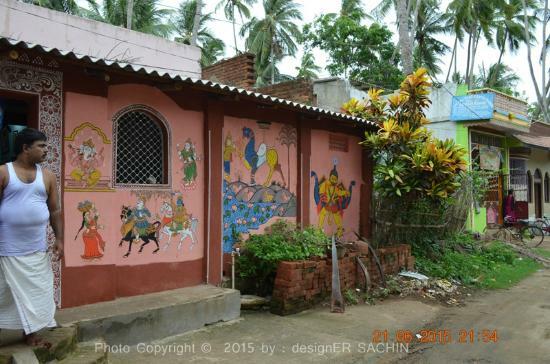 INTACH selected this village to revive the ancient wall paintings of Orissa. The work has already been completed and now the village looks like a living museum of paintings. The preparations for Durga Puja or ‘Pujo’ have begun and you can feel the buzz in Kolkata (and I am sure in most parts of Bengal). 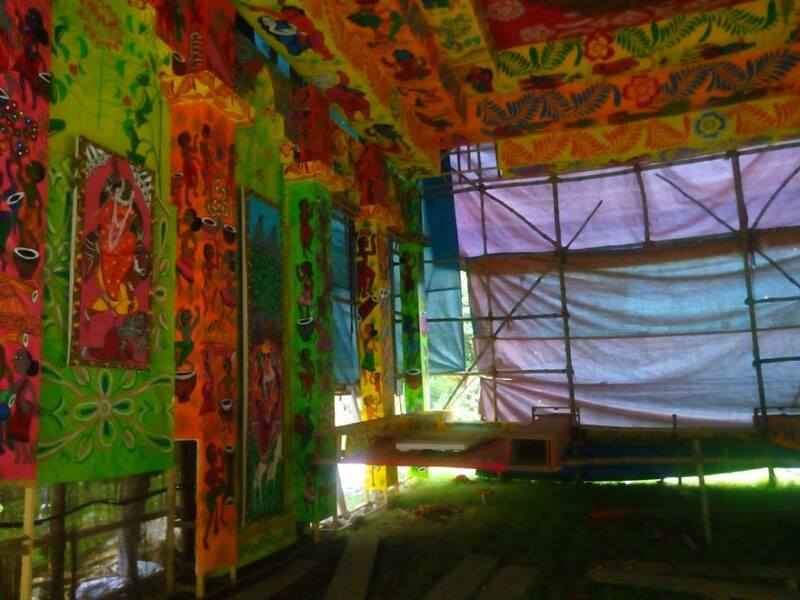 Patachitra paintings have found a place of pride in the ‘pandals’ at Fortune City, Old Jessore Road painted by artisans from Rangamaati. With a vision of facilitating livelihood for rural artisans through revival of languishing craft & facilitating market by way of eCommerce & retail sales, Rangamaati has been doing commendable work. Kudos to the team! Accidentally stumbled upon your blog. Happy accident I must say. It is such a rich tapestry of visual, stories and ideas. I would like to reach out to know if we can collaborate in some ways…. I have founded a product discovery platform and would like to list some of the products/vendors that you have showcased. Please let me know if this is possible? Congratulations and wishing all success for your product discovery platform.